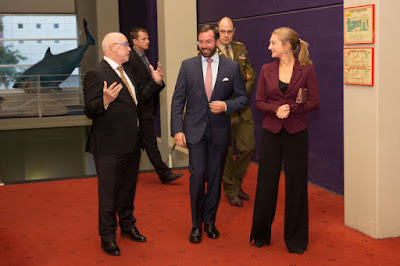 Last night, Hereditary Grand Duke Guillaume and Hereditary Grand Duchess Stéphanie were on hand to watch the preview of the documentary film "1000 Joer Buerg Clierf". The documentary, produced by Ernest Koener, chronicles one thousand years of the history of Château de Clerveaux, which, fun fact, was once owned by the family of the Hereditary Grand Duchess, the Lannoys. Another picture is available at the cour.